Thanks for checking out the FrankBlack.Net Podcast! Use the menu above to find everything you ever wanted to know about the podcast, or select one of the badges above to add our podcast to your player of choice. Don't forget to check out our Episode Guide or, if you have questions, read some of the most Frequently Asked Questions. 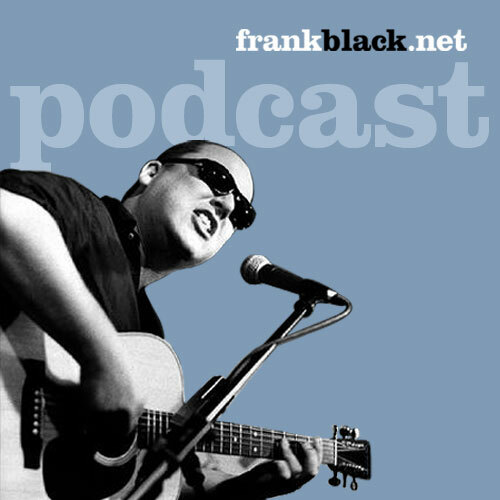 Our goal is to provide dedicated fans and new listeners alike with some of the best works of Frank Black, whether that comes from his time with the Pixies, solo, or with the Catholics. Live cuts, b-sides, album tracks, unreleased gems, and other goodies can all be found here, free and legal, courtesy of Frank Black, his labels, and FrankBlack.Net. Live Performances - Exceptional live recordings that are almost as good as being there. Sometimes we'll choose songs because they are completely different in style than the original recording. Album Tracks - For people just getting into Frank Black, this should help give an idea of what to expect from the many different albums. For old hats, this is a chance to go back and hear a song that otherwise might be left to the sands of time. Either way, it's more Frank goodness. Exclusives/Rarities - Tracks that are extremely hard to find, sometimes coming from Frank Black's personal vaults, somtimes containing never-before-released material. We try to ensure there is at least one of these on every show. Underrated Picks - Songs that nobody seems to talk about, but should be. Covers - Whether from one of our two tribute albums or somewhere else entirely, a cover can provide some insight to the song or just be fun to listen to. Frank Black to Back - With as an extensive a catalog and diverse a range as Frank Black's, it's only natural that old songs can take on new sounds. We'll compare two different versions, but the decision about which is best is left up to you. Guest Spots - It could be a story about a Frank Black encounter from a fan, it could be an interview with a collaborator of Frank Black, it could even be the man himself. Perhaps, in the case of collaborators, we will be able to play a song from their own projects. Salon Selections - The Frank Black Forums are home to many musicians, some famous, and some... not. That doesn't mean they shouldn't be, though, and once in a while, when a band crosses our paths that we think you'd like to know about, we'll share them with you. So why not check out a few episodes, see what you have been missing. And, of course, if you think we are missing something that would enhance the podcast experience, by all means we'd like to know about it. Send Dean or Brian an email.